Tommy McVie benefited from many assists by Guyle Fielder, and is now assisting Fielder on the promotion of a new book about the Seattle hockey icon. Tommy McVie grew up in a nearly destitute family in the Consolidated Mining and Smelting company town of Trail, B.C., finally escaping it as a teenager with a single used hockey stick and pair of skates paramount among his few possessions. Now in his 80s, McVie can reflect on 21 seasons as a pro with eight franchises, 28 more as a coach — nine as a head man in the National Hockey League and World Hockey Association — and 22 spent in service to the Boston Bruins, the majority of those as a scout. Fans with knowledge of Seattle’s sporting history are likely to recall that Fielder is the city’s all-time hockey icon. Starting in 1953-54, “Golden Guyle” spent 15 seasons in a Seattle uniform, including 11 with the Totems, whom he led to three Western Hockey League titles and five WHL finals. Fielder topped the league in scoring seven times, was an 11-time All-Star and won six league MVPs. 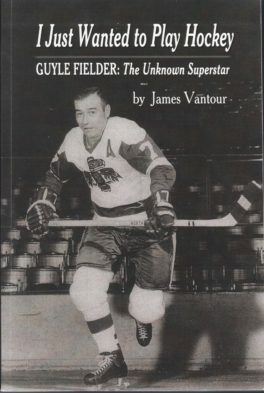 Fielder’s story is documented in a new book, I Just Wanted To Play Hockey / Guyle Fielder: The Unknown Superstar by James Vantour, who spent two years resurrecting one of the sport’s most fascinating stories. Fans can acquaint themselves with the details in two ways. Friday, Fielder will be featured at a benefit luncheon from 11 a.m. to 1:30 p.m. at the ShoWare Arena in Kent. Saturday, Fielder will make an appearance before the Seattle Thunderbirds-Everett Silvertips game at ShoWare to autograph copies of the book, for which McVie is acting as the self-appointed tub-thumper. (For more information, contact Marc Blau at 253-677-2872 or at mhblau@comcast.net). “First off, the book is a really, really good read,” said McVie, who borrowed a truck earlier this week in order to transport 500 copies to a book signing near Portland, where both Fielder and McVie spent time during their Western Hockey League careers. 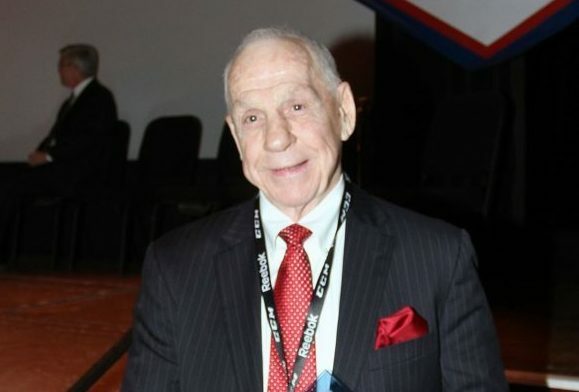 McVie played for a junior club in Prince Albert in 1954-55 and for the Toledo Mercurys of the International Hockey League in 1956-57 and 1957-58 before trying to make the Seattle Americans as a walk-on. He didn’t get much of a shot, getting into three games playing on a line with Dennis Olson and Rudy Filion. He notched a couple of assists. One day, head coach Keith “Bingo” Allen took McVie aside and asked him if he could play right wing, a position where the Totems needed help. McVie said he could, even though he never had. McVie ended up on a line with Fielder and Val Fonteyne and scored 26 goals with 23 assists in 50 games. At the time, McVie thought he’d never score 26 goals in a season. Of McVie’s 26 goals, nine were game-winners, a league single-season record, including the first goal he scored as a professional. McVie spent three seasons with the Totems, tallying 27 goals and 44 assists in 1959-60 and 33 goals and 32 assists in 1960-61. Ahead of the 1961-62 season, the cash-challenged Totems dealt MvVie to the Portland Buckaroos, ending his involvement with Fielder as a teammate. McVie skated for the Buckaroos from 1961-62 through the 1965-66 season, averaging more than 35 goals and 70 points per year. After a year with the Los Angeles Blades and two more with the Phoenix Roadrunners (1967-68, 1968-69), McVie returned to the Totems for 1969 through 1972, by which time Fielder was nearing the end of his career, with the Salt Lake Golden Eagles. McVie served as a player/coach for the Johnstown Jets of the Eastern Hockey League in 1972-73 and in the same capacity for the Dayton Gems of the International Hockey League in 1973-74 beforebecoming into a full-time coach with Dayton in 1975-76. He won a lot of games and was hired by the NHL’s Washington Capitals in 1975-76 as a replacement for the fired Milt Schmidt, who began that campaign with a 3-28-5 mark. Under McVie, the Capitals lost their first 11 and finished 11-59-10. “Hard to win the Kentucky Derby with a bleeping mule,” McVie advised The Washington Post about that club. Mann may have been premature in that assessment. As he wrote, the Mariners had just turned two years old and were embarking upon the second of 15 consecutive losing seasons. McVie moved to the Winnipeg Jets of the WHA in 1978-79 and won a league championship. After three years with the Jets, he coached in the minors for a decade before getting his second shot as an NHL head coach with the New Jersey Devils. He directed two playoff teams, but still received a thumbing, and then moved to the Boston Bruins first as an assistant coach and then in an executive/scouting capacity. Former Thunderbirds goaltender Corey Schwab was in the Devils’ system when McVie coached there. Funny how those Capitals turned out. After those horrific first years, they started drafting smartly and swindled the Montreal Canadiens in a package trade for superstar defenseman Rod Langway, and became one of the best regular season teams in the ’80s and ’90s. Unfortunately they couldn’t quite get over the hump in the playoffs, through bad luck or inspired opponents (like in their only Stanley Cup appearance, where they were swept by monstrous Detroit). Even now, with superstar Alex Ovechkin, they’ve been great in the regular season but haven’t seen the conference finals in ages. so many great and fun memories with the Totes in the 60’s! Fielder and McLeod..and a failed expansion NHL franchise.